(August 13, 2013 – Brooklyn, NY) Over the past year Mike WiLL Made It has become the most sought-after producer in hip-hop, R&B and, increasingly, pop, having produced 12 Billboard-charting singles, including three number one singles, while working with some of the biggest names in music, including Rihanna, Kanye West, Jay Z, Lil Wayne, 2 Chainz, Future, Juicy J, Brandy, Ace Hood, Gucci Mane, Kelly Rowland, and more. Most recently, Mike WiLL Made It produced the lead single, “We Can’t Stop,” from Miley Cyrus‘ forthcoming album, BANGERZ, currently a top-five single in more than 10 countries, with over 135 million views on VEVO. Now, with his own official debut album, Est. In 1989 Pt. 3 (The Album), announced, and the album’s lead single, the Miley Cyrus, Wiz Khalifa, and Juicy J-featuring “23,” planned for release on August 26th, Billboard has anointed Mike WiLL Made It “The Hottest Producer In The Game,” featuring him on the cover of its June 17th issue. 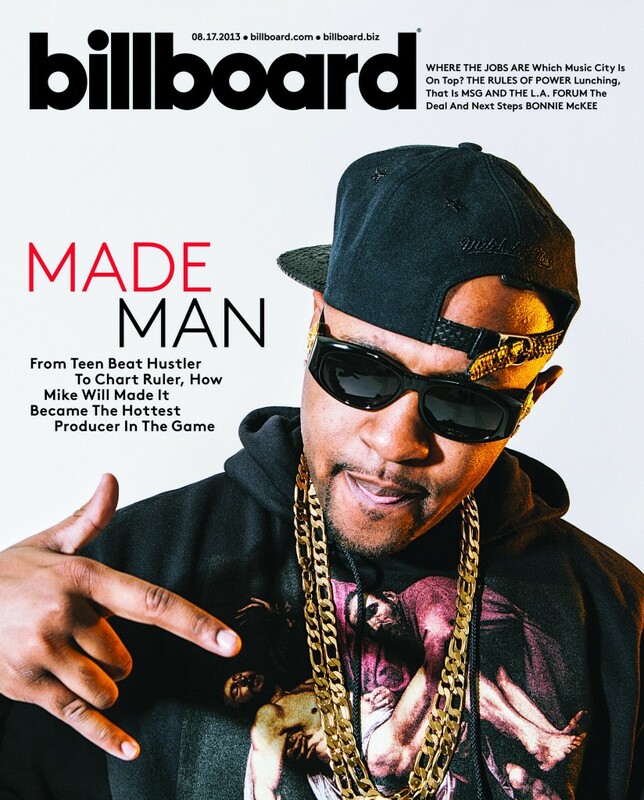 This is Mike WiLL’s first cover feature, and the story chronicles the super producer’s path from upstart, 16-year-old producer passing beats to Gucci Mane to becoming one of music’s most valued hit makers, joining a short list of true “super producers” alongside the likes of Timbaland, Pharrell, Diplo and Dr. Luke. It’s safe to say that no producer in hip-hop had a bigger, more productive year than Mike WiLL Made It in 2012. Mike WiLL spent 2012 producing three Billboard number one singles and co-producing on a fourth and, elsewhere, producing for the likes of Rihanna, Chief Keef, French Montana, Brandy, Gucci Mane, Kelly Rowland, and more. On December 24th 2012, Mike WiLL Made It released Est. In 1989 Pt. 2.5, the third installment of his Est. In 1989 mixtape series. The tape includes features from Gucci Mane, Rihanna, Kelly Rowland, Juicy J, Big Sean, B.o.B., French Montana, Young Jeezy, Lil’ Wayne, Rick Ross, TI, and more. In 2013, Mike WiLL Made It has continued his hot streak, producing for the likes of Jay Z, Ace Hood, and more, including Miley Cyrus, for her breakout new single, “We Can’t Stop.” Mike WiLL has since announced his own album, Est. In 1989 Pt. 3 (The Album). The album’s first single, “23,” features Miley Cyrus, Wiz Khalifa, and Juicy J and will be released on August 26th.